Never let it be said that I do not take requests. 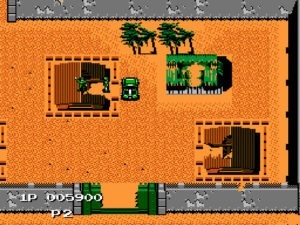 Jackal is a Konami title playing off the 1980’s common themes of U.S. patriotism and hostage rescuing. Like 1942, I must again ask what interest a Japanese company has in these concepts. Also, why was hostage rescue such a big game premise for the time? Was it a holdover from Iran? Because Rambo was doing it? Because saving lives instead of taking them made for an inoffensive, jingoistic military game goal? More than anything, Jackal is Choplifter on land. You drive around in a Jeep, complete with mounted machine gun and a grenade-lobbing or rocket-shooting guy in the passenger seat. 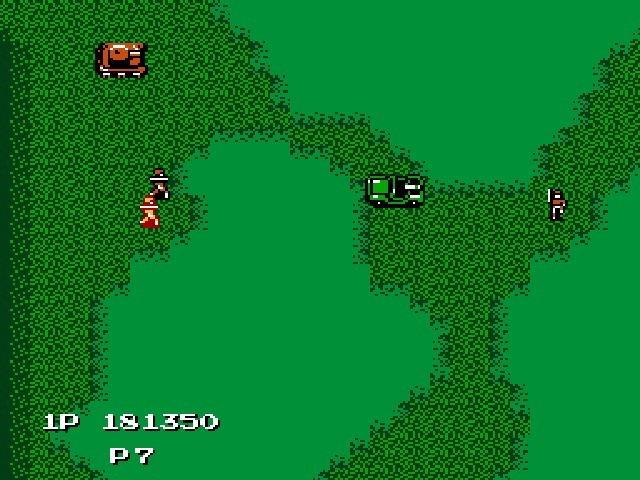 You dodge tanks, enemy troops, and rotating cannons as you attempt to find POW camps. When you locate one, you blow the sheds open with your explosives, and the guys all pile in the backseat. Then you drive them to an extraction point. If you’ve played Choplifter, doesn’t this sound familiar? The shooting open of hostage sheds, picking up the guys within, and the high-tailing it to safety are certainly similar. The extraction point is even a helicopter landing pad located further down the road, and still behind enemy lines. I like to think that it is the guy from Choplifter landing the helo to pick up the troops, effectively tying the two games together. You may entertain whatever fantasies you like as to who’s behind the stick – Stringfellow Hawke, Howlin’ Mad Murdock, whatever your mind can conceive. The entire game is played across six stages in an overhead view. Controlling your Jeep is a simple arcade exercise, with traction or momentum not considered. This allows for easy bullet-dodging and general maneuvering, which is a plus when you consider how much ordinance is going to be thrown at you. For weapons, you have a machine gun that will always fire toward the top of the screen, allowing you to do strafing runs or ward off pursuers as you retreat. The grenades will always lob toward the direction the car is facing. This allows you some defense in any direction, or the ability to drive up to the side of fixed emplacements and take them down. For a final resort, you have the car itself – any soldiers running around are fair game for your grille. The only powerups come in the form of special blinking POWs, usually stored in green shelters away from the camps themselves. I presume these fellows are meant to be captured weapons specialists. The first you rescue gives you a rocket upgrade with a greater range than the grenades. The second gives a rocket that explodes after a set distance, but also shoots destructive fire out horizontally from that point of impact. This allows you to detonate the rocket between two emplacements and take them both out at the same time. The last guy will give you a rocket that shoots out fire in four directions. 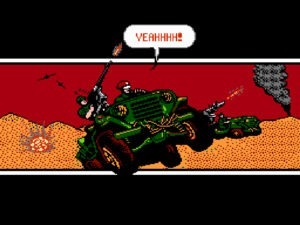 Otherwise, there are no armor or life powerups, and any hit from any weapon will destroy your Jeep in one shot. That’s pretty much it. 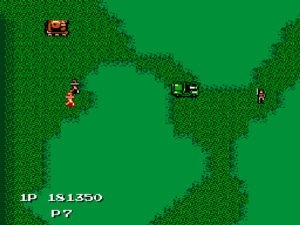 Visually, each area is immediately recognizable, though most of their looks have been replicated before in other NES games. 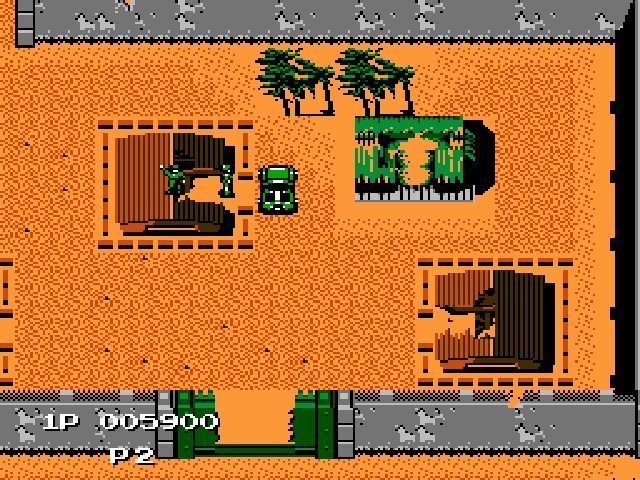 I can’t make the claim that Jackal is stealing, because there’s only so many ways you can make a jungle or desert out of the limited colors and limited detail the NES affords. They still look very nice and very clear for the system, particularly in the desert and industrial areas. The swamp leaves something to be desired, but the distinction between grass and boggy water is, at least, clear. The sounds I can harp on a little more, as they are direct from the archives of Konami’s subsidy Ultra. It didn’t help that I recently played Teenage Mutant Ninja Turtles, because between the familiar “ding” of ricocheted metal and the explosions, it sounded like I was still playing the same game. It’s a fun little arcade experience if you have some free time, and worth playing through to the end. The one-hit-kill aspect makes it challenging, with the easy driving controls offering a nice balance. It certainly has some exciting moments, though I would have like to have seen some chase scenes, or something more than repeatedly driving past and through static defenses. The fact that you’re on land and in a car isn’t used in any specific or unique manner, making it not much different than other vertical shooters. Still, it’s a good choice if you enjoy these kinds of arcade challenges. Fun arcade action scroller. Upward-shooting gun and directional-shooting explosives setup is very helpful. Competent, but has little to set it apart from similar games.